Austin “Chumlee” Russell of Pawn Stars threw a romantic birthday celebration for girlfriend Tanya Hyjazi at Joe Vicari’s Andiamo Italian Steakhouse inside the D Las Vegas, Sunday, March 24, 2013. Chumlee and Tanya, who were the personal guests of the D Las Vegas’ owner Derek Stevens, enjoyed the company of Tanya’s close girlfriends as they dined on authentic Italian delicacies in an intimate setting at Andiamo restaurant. 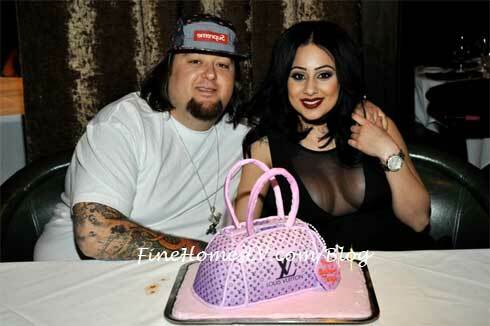 To conclude the meal, Chumlee surprised the birthday girl with a cake shaped like a Louis Vuitton bowling bag purse. Later in the night, the duo headed down to the casino where they played blackjack in the high limit room with the D’s signature dancing dealers. Andiamo, which opened last month in the D Las Vegas, has garnered dazzling reviews and has quickly become a hot spot for the who’s who of Las Vegas, offering luxury service and gourmet Italian cuisine in downtown Las Vegas. The award-winning restaurant concept is the first venture outside of Michigan for prominent Motor City restaurateur Joe Vicari.